Dr. Fred Sorrells shows young amputee Jean Peter how to kick a soccer ball with crutches. Pierre Richard Bruny with Dr. Fred Sorrells. Pierre Bruny visits with two earthquake amputees as they await their physical therapy session. Amputee Soccer has been described as the greatest one-legged game in the World! It began as a rehab and strengthening activity in the 1980’s. However, those who played it found it was great as a real sport outside the rehab setting. Amputee Soccer soon spread from local fields and arenas to become a global sport with its own World Cup. The next World Cup of Amputee Soccer will be held in Argentina this October. The international game is 6 v 6 + keeper, but there are enough variations in the game to allow local teams to play with as few as 3 v 3 with or without keeper. Amputee Soccer is international and involves Russian and other Eastern European veterans of Afghanistan, West African combat survivors and even Middle Eastern players. Most recently this amazing sport was introduced in Haiti – to help amputee survivors of the fifth worst earthquake in human history. 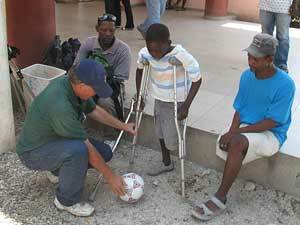 Amputee soccer’s introduction to Haiti came in an unusual way. IIOS President Dr. Fred Sorrells noticed the large number of amputees during his visits to hospital wards following the January 12 earthquake. Children, teens and adults were all affected. Many had played soccer prior to the earthquake. It became apparent that Amputee Soccer could relieve trauma, provide rehab activity, and help amputees re-integrate into society. When Dr. Sorrells returned from his third trip to Haiti in April, he discovered that the Haiti National Soccer Team was in San Antonio, Texas – hosted by the San Antonio Sports and housed at T Bar M Ranch. Dr. Sorrells made his way to T Bar M Ranch and shared his vision of amputee soccer with team captain Pierre Richard Bruny and other members of the team. 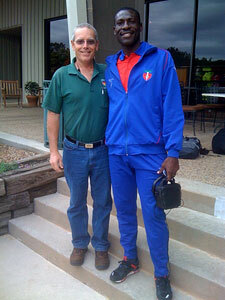 Pierre Bruny agreed to help launch the amputee soccer program in Haiti. When Dr. Sorrells returned to Haiti in June, true to his word Pierre became the driving force behind efforts to introduce the greatest one-legged game in the World! Amputee Soccer is an excellent rehabilitation activity, so Pierre Bruny and his associates have started visiting rehab programs in Port-au-Prince to encourage them to participate in the sport. Dr. Sorrells worked with Pierre and his associates to teach the fundamentals of the game to interested amputees. Amputees from Port-au-Prince gather for an amputee soccer training session.